On Oct. 27, in federal district court, a jury delivered a not-guilty verdict for Ryan and Ammon Bundy and five other defendants, on charges stemming from their 41-day armed occupation of Oregon’s Malheur National Wildlife Refuge early this year. The verdict came as a shock to many on both sides of the issue, with even some defense lawyers predicting a conviction. But several factors, including the diffuse nature of the Bundys’ movement, strategic jury selection by the defense and the difficult-to-prove conspiracy charges, doomed the government’s case. In February, the Bundy brothers will again face a jury, this time with their father, Cliven, over their April 2014 standoff with federal agents attempting to round up illegally grazing Bundy Ranch cattle in Nevada. If prosecutors in Nevada learn from their Oregon counterparts’ mistakes, it could help them bolster their case. “The government had a practice run, and they know what they did wrong and did right,” says defense attorney Shawn Perez, appointed to represent Bundy supporter Richard Lovelien in the Nevada trial. But first, prosecutors have to grapple with just what went wrong in Oregon. 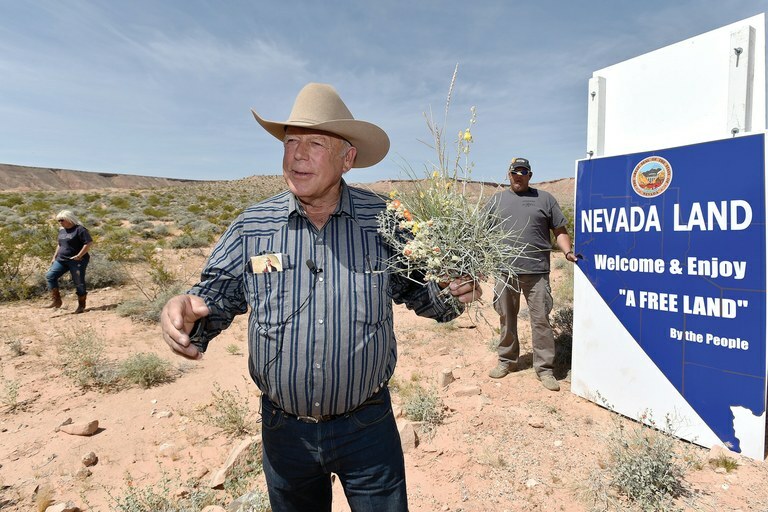 Cliven Bundy holds a bouquet of scrub in April 2015 near his ranch in Bunkerville, Nevada, during a celebration of the one-year anniversary of his standoff with the Bureau of Land Management. He’ll be in federal court on charges surrounding the Nevada standoff in February, along with sons Ryan and Ammon. The Malheur occupation movement’s leaderless nature challenged prosecutors from the start. Ammon Bundy certainly inspired the militants, but as news spread to networks of sympathizers via social media, the occupation took on a life of its own. With no clear leader in charge, especially when it came to people outside the refuge in the town of Burns, pinning responsibility on any of the seven defendants was difficult. Prosecutors had planned to use testimony from federal employees and locals who felt threatened during the occupation. But in August, defense attorney Matt Schindler filed a motion to limit the government’s ability to use some of those witnesses. “There was no evidence connected to anybody in this case,” Schindler says. The defense also argued that people’s feelings didn’t prove the defendants’ intent to intimidate them — key to the conspiracy charges the government sought to prove. The defense attorneys’ aggressiveness in shaping the jury also paid off. Federal cases usually draw jurors from within 100 miles of Portland. But the defense team requested that the jury pool include the entire state. “We ended up getting the kinds of people we wanted: rural people, pro-gun or gun owners,” says attorney Robert Salisbury, who ranked 200 potential jurors for favorability. “We also wanted people who would be able to think for themselves,” and not be swayed by previous media coverage of the standoff. Nineteen of 20 of the final jurors and alternates were among Salisbury’s top choices. Finally, the defense team managed to bring an FBI informant to the witness stand, through what Schindler calls “some kind of investigative miracle.” The appearance of an informant led to the government revealing that nine occupiers were actually informants. “You can’t be part of a conspiracy if it’s you and a government informant,” Schindler says. One juror told Schindler that this information swayed a fellow juror. The conspiracy charge was always going to be difficult to prove, but simply charging the occupiers with trespass, a misdemeanor that doesn’t always result in a jail sentence, likely would have been an equally embarrassing outcome for the Department of Justice. All these factors could come into play in Nevada, complicated by whatever changes occur in President-elect Donald Trump’s departments of Interior and Justice. And if government informants were present at the standoff, prosecutors may find that an added challenge: Revealing informant identities can compromise other ongoing investigations. Jurors will likely be chosen from the southern Nevada division that includes Las Vegas — unless defense attorneys get the judge to expand the pool, as they did in Oregon. Still, Nevada attorneys have a different case to make: In April 2014, protesters and federal officers faced off directly, unlike in Oregon, where occupiers arrived at the refuge when no employees were present. In Nevada, standoff participants interfered with federal agents’ attempts to impound the illegally grazing cattle. Bundy supporter Ryan Payne told reporters that he helped plan “counter-sniper positions” against federal agents. In Malheur, occupiers seemed to be more focused on spreading their ideology, rather than physically thwarting a specific federal action. Seventeen Nevada defendants’ charges do include conspiracy to impede federal officers. But unlike in Oregon, they’re also charged with obstruction of justice and assault on a federal officer. The case is not a slam-dunk: Prosecutors must do more than just show that federal officers felt threatened; they have to definitively prove that the defendants’ actions were unlawful. One Malheur juror emailed the Oregonian: “Doesn’t (the public) know that ‘not guilty’ does not mean ‘innocent’?” Whatever the outcome, the February trial likely will not be the last time the nation confronts the Bundys and the movement they represent.